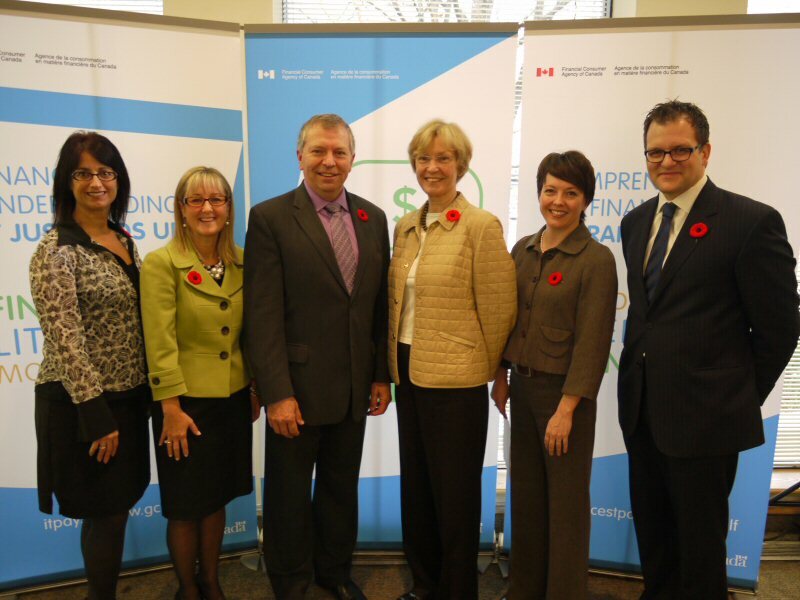 The Honorable Ted Menzies, Minister of State for Finance and Ursula Menke, Commissioner of the Financial Consumer Agency of Canada (FCAC), officially launched today the start of the second annual Financial Literacy Month (FLM) at a ceremony in Ottawa that follows a series of regional events across Canada in the past week. To mark the occasion, Minister Menzies and Commissioner Menke were accompanied by Tom Hamza, President of the Ontario Investor Education Fund (IEF), Josée Cousineau, Director of Operations at Carrefour Jeunesse Emploi de l'Outaouais and Tamera Van Brunt, Chair of the Investor Education Committee of the Canadian Securities Administrators (CSA) and Director of Communications and Investor Education for the Alberta Securities Commission (ASC). "Financial Literacy Month is an opportunity to raise awareness on the importance of acquiring life skills that can allow Canadians to act knowledgeably and with confidence when managing their personal financial affairs" commented Minister Menzies. "Our Government is committed to enhancing the financial well-being of all Canadians both by increasing awareness of financial literacy resources, and by strengthening the existing consumer protection framework through a variety of regulations introduced since 2010 on issues as diverse as prepaid cards and credit agreements." During November, community organizations, volunteer groups, government agencies and the private sector will team up to offer seminars, workshops and other events to highlight the importance of financial literacy in today's economy. "The aim of today's launch is to showcase the many tools, resources and sources of information that are already available to Canadian consumers to help them improve their financial knowledge and their confidence in making financial decisions", said Commissioner Menke. Engaging youth early in financial literacy is another key objective of FLM. Their energy and creativity can have a significant impact on public awareness. FCAC hopes to capture this energy and creativity through the youth video contest it launched today. Thirteen to 19 year old students will have until November 30 to submit their one to three minute video entries. The entries will be shown on FCAC's YouTube channel throughout November. Three winners will be selected and will be awarded great prizes for their submissions. In addition, a "viewer's choice" award will also be presented to the finalist video with the greatest number of "likes" on YouTube at close of day, December 13. For more details on deadlines and prizes, visit FLM's Web pages at itpaystoknow.gc.ca/flm. You can reach FCAC through its Consumer Services Centre by calling toll-free 1-866-461-3222 (TTY: 613-947-7771 or 1-866-914-6097) or by visiting their website: itpaystoknow.gc.ca.